That term was coined amid the liberal uprising in the wake of Trump’s inauguration, when a cascade of Democratic candidates prevailed in the 2017 special elections by decisive margins. Buoyed by progressive rage, Virginia’s Danica Roem and Alabama’s Doug Jones won races that once seemed unthinkable. Roem, a political unknown who canvassed on repairing a local highway, beat incumbent Bob Marshall by eight points. Marshall, a self-described homophobe who wouldn’t call Roem by her correct pronouns during the race, had served in Virginia’s House of Delegates for more than two decades. The upset made Roem the first openly trans person to ever win a statewide election. In Baldwin’s home state of Wisconsin, the “blue wave” has led to a record number of women running in local elections. In total, more than 75 female candidates have tossed their hat in the ring, and 45 of those political hopefuls will be campaigning for the state legislature. That money has primarily come from three sources: the Koch brothers and right-wing mega-donor Richard Uihlein. An Illinois multi-millionaire who was the single largest donor to notorious anti-LGBTQ bigot Roy Moore’s failed Senate bid, he has dumped millions into PACs to oust Baldwin in the 2018 midterm elections. Uihlein has donated what the local Democratic Party estimated is $17 million to elect political newcomer Kevin Nicholson. Nicholson, a former College Democrats of America president who spoke at the 2000 Democratic National Convention in favor of Al Gore’s presidential run, claimed he underwent a political conversion while stationed in Iraq and Afghanistan with the Marine Corps. During a recent interview with Steve Scaffidi of the Milwaukee talk radio station WTMJ-AM, the born-again conservative said it was there he began to question the “cognitive thought process” of any veteran who votes blue. To put those numbers in perspective: A source close to Baldwin’s campaign claimed those totals are more than the money spent against the other 25 Senate Democrats defending their seats this year—combined. The donations also began extremely early, with right-wing groups starting their spending spree as early as February 2017. “The fact that it was happening at such a high level, at such a sustained level, and at such an early time—that’s what got us really spooked,” the source claimed. Over $10 million has bought conservatives a lot of airtime in the months since the donations began pouring in last year. One ad accused Baldwin, who is pro-choice, of wanting to abort the next Rosa Parks or Martin Luther King. Another TV spot from the Concerned Veterans of America, which reportedly cost $1.5 million, alleged that the Senator failed to respond to reported abuses at a VA Medical Center in Tomah, Wisc. It claimed her inaction resulted in three deaths. Politifact rated those allegations as “false,” but when lies are said loudly enough and often enough, they have a way of sticking. Polls show that while her support in Wisconsin has been holding firm, opposition has been steadily increasing. At the time of writing, she’s sitting near a 37-37 percentage split. 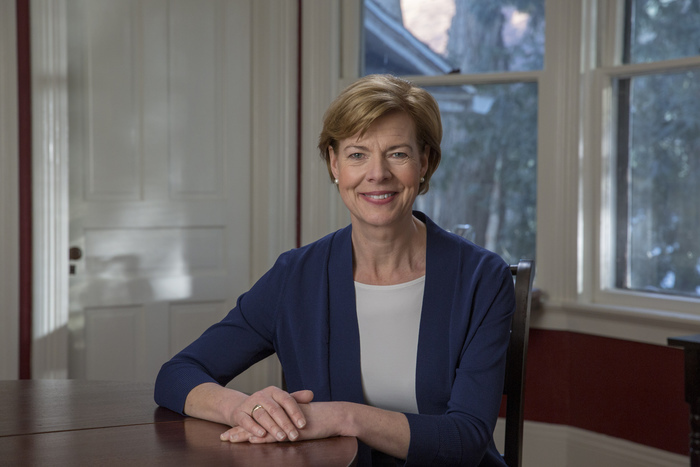 Griffin emphasized the trust Baldwin has built with voters during a meet-and-greet held with phone bankers canvassing on behalf of the campaign earlier that day. A group of elderly women said to be friends with the candidate’s aunt flew in from Seattle for the speech. As Griffin called the longtime representative “one of the hardest-working United States Senators today,” the room smelled like a tinfoil-wrapped pastrami sandwich that one of the ladies clutched to her chest during the speech. “She knows how to bring folks together of both parties on issues and find common ground, build coalitions, and get things done,” he said. It’s often said that former President Bill Clinton has the ability to remember the names of everyone he meets, but as Baldwin made her way around the room shaking hands with the Seattle crew, she noted who she hadn’t met yet. I hung back as Baldwin greeted everyone who would be dialing voters on the campaign’s allotted Motorola flip phones, jet-black burners with callback numbers helpfully labeled on their backsides. When we finally shook hands a half-hour later, Baldwin proved her advertising wasn’t misleading. “Hi, I’m Tammy,” she said, despite needing no introduction. Baldwin’s team, nonetheless, is focusing on “reintroducing her” to voters in the 2018 midterms, even after a three-decade career in politics that extends back to her 1986 election to the Dane County Board of Supervisors. She is a career public servant in the truest sense: first elected to the Wisconsin Assembly in 1993 before serving 14 years in the U.S House of Representatives—from 1999 to 2013. Baldwin has represented Wisconsin’s under four presidential administrations: Bill Clinton, George W. Bush, Barack Obama, and now Donald Trump. Supporters credit her ability to get personal with voters, and her reelection campaign is emphasizing that vulnerability by showing new sides of Baldwin to constituents. Earlier this month, she opened up about her late mother’s opioid addiction for the first time. Her mother, Pamela Bin-Rella, died last August at the age of 75. In doing so, the campaign learned an important lesson from Democrat Patty Schachtner, a Wisconsin mom with a dreamcatcher forearm tattoo elected in a Republican district last November. Although the success of outsider candidates in 2018 like Kentucky’s Amy McGrath show progressives are looking for change, Schachtner has credited her victory to a handwritten postcard campaign. Her team penned postcards to constituents trumpeting her “common sense solutions” on the issues. Schachtner won by a decisive 10-point margin in Wisconsin’s 10th, which had been held by conservatives for 16 years. Officials close to Baldwin’s campaign said that human touch matters most. “That’s the attitude she has: ‘If I open myself up and show myself as a human, they’ll see that these ads saying that I don’t care can’t be true,’” sources claimed. After the story went to print, a man that Baldwin described as a “big-barrel chested Irishman” hastily approached her at a campaign event. She smelled trouble, but the gentleman actually came up to pledge his support in the race. The reality is that despite appearing to represent the alleged “establishment politics” McGrath railed against in Kentucky’s 6th Congressional district—which allowed her to whittle down a massive 40-point deficit in the race—Baldwin has been an outsider her entire career. When she was elected to the U.S. House of Representatives 19 years ago, Baldwin was the first LGBTQ lawmaker to be out at the time of her victory. She would repeat the gesture 14 years later after graduating to the upper house of the legislature. To date, Baldwin remains the only openly queer representative in the 229-year history of the U.S. Senate. At least five LGBTQ candidates are running in the 2018 race to give her some company. 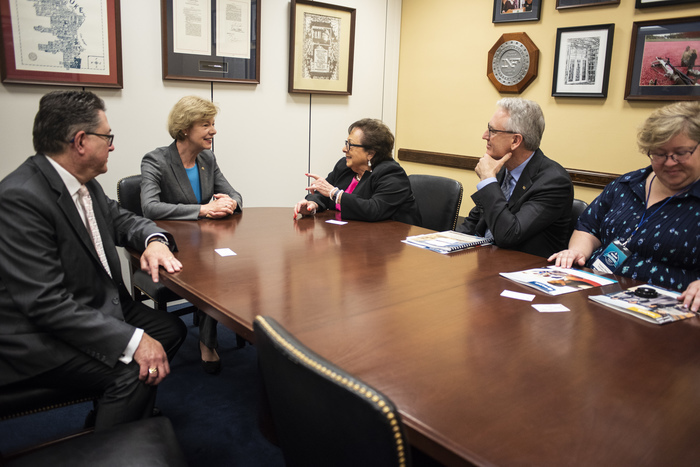 Given the significance of protecting her seat in the Senate when Democrats face an extremely difficult reelection map, the Human Rights Campaign plans to make a “major investment” in Wisconsin during the 2018 midterms. The Badger State commands an estimated 152,000 LGBTQ voters, which is an already massive total without before factoring in allies supportive of queer and trans rights. Trump won Wisconsin in 2016 by just 22,000 votes—meaning this population, if activated, has the potential to tip the scales in Baldwin’s race. Supporters say there’s precedent for the LGBTQ community coming together to stand its ground in the face of unprecedented challenges. After Gov. Pat McCrory signed North Carolina’s infamous anti-trans bathroom bill into law in March 2015, he was unseated by Democrat Roy Cooper in the following year’s gubernatorial election. The symbolism of McCrory’s defeat couldn’t have been more pointed: Cooper was the Attorney General who refused to defend House Bill 2 in court. 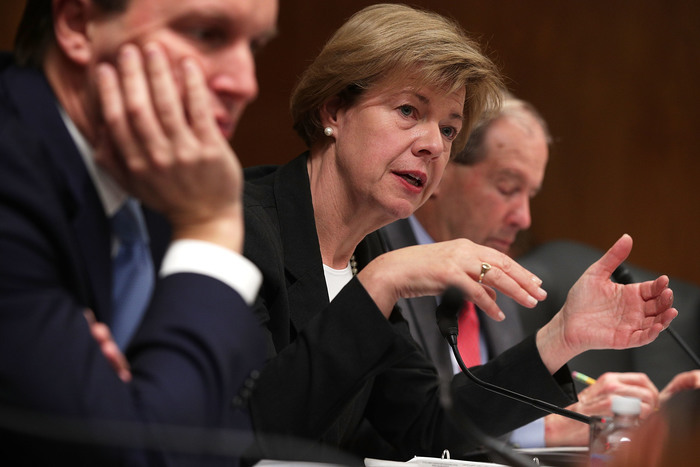 Baldwin will have two months before she officially faces off against a challenger in Wisconsin’s U.S. Senate race. The GOP primaries will be held on August 14, and there are four candidates in total. Nicholson’s biggest competition in that race is State Senator Leah Vukmir, who received the backing of the Wisconsin Republican Party by winning 73 percent of delegates during the state’s GOP convention in May. After winning the nomination last month, Vukmir said she was ready to “finish the job” in her acceptance speech—by sending Baldwin packing. That statement was likely a thinly veiled reference to a larger transformation in local and national politics over the past decade. Ten years ago Wisconsin had two Democratic Senators, Herb Kohl and Russ Feingold, as well as a Democratic governor, Jim Doyle. It was a “blue state with a hint of purple,” sources say. But after the Supreme Court’s 2010 decision in Citizens United v. FEC overturned the ban on campaign donations by corporations and unions, Feingold and Doyle were ousted, while Kohl retired. Baldwin is the last remaining Democratic holdout at statewide office. But attired in a simple lavender-colored blazer with her soccer mom haircut, Baldwin insisted she won’t be wiped out by the green wave. Polls agree she has continued to perform strongly, despite the odds. A March survey from Public Policy Polling found that she leads both Vukmir and Nicholson by double digits in hypothetical matchups. If her career has illustrated the importance of LGBTQ candidates having a seat at the table, 2018 will demonstrate the importance of keeping that seat.